All inclusive Glyfada holidays are in the sunny Greek island of Corfu. Glyfada is the ultimate beach destination when it comes to Corfu holidays. Most of the resort revolves around the beach and many visitors on all inclusive 2019 / 2020 packages to Glyfada find that this is where they spend the majority of their time. Suitable for: Couples and families with young children. Beach: Changing rooms and toilets available. Extra Info: Water sport hire available.. The beach here is made of soft bronze sand that is a delight to feel in between your toes. 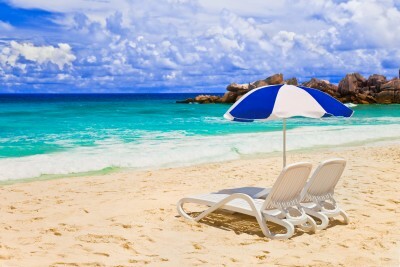 You can hire out sun loungers on the beach on Glyfada holidays as well as parasols. There are also changing rooms for families with young children where the toilets are as well as showers and even a medical building in case of accidents or emergencies at the beach. This is particularly handy on holidays to Glyfada if someone should have a particularly nasty case of sunstroke. There is also a good range of trendy beach bars that line the shore including Aloha Beach Bar which is probably the liveliest. Boats and water sports equipment is available for hire on the beach if you would like to take to the seas. Shopping on all inclusive at Glyfada is easily done in one morning. There isn’t a great selection or variety of stores here so don’t expect to find any one of a kind souvenirs or great bargains. Most shops sit around the beach and sell the usual cheesy fridge magnets and naff t-shirts. There are two main supermarkets a little further inland on all inclusive holidays Glyfada where you can pick up a few essentials.